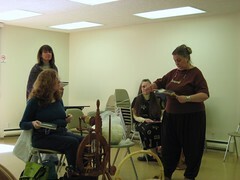 Here, Steph's showing how to reel off the freshly spun singles. There's quite a bit of distance, because this helps to even out the twist. Next comes measuring the grist of the singles - length and weight. 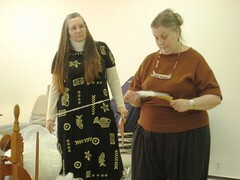 After measuring the length and weight of the yarn (and recording it too! 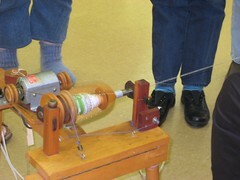 ), it's put on this squirrel cage swift for reeling back to a bobbin. 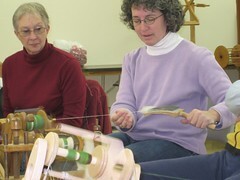 After winding to the bobbin, it can be plied. I imagin you're wondering why she winds on to a reel, then onto a squirrel cage? 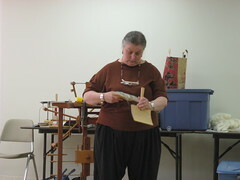 Well, the reel has a set diameter, so you can measure the yardage (and the weight after you take it off). If, at this point, you take these singles and set the twist, or dye them, or even just have a sproingy yarn, you might not be able to get the skein back onto that reel. 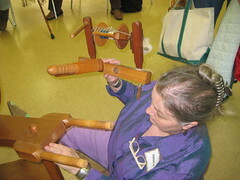 Here, you can see Steph winding onto a bobbin to get ready for plying. 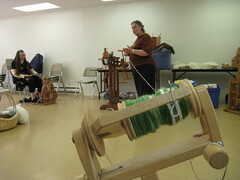 OK, I'm getting carried away by the bobbin-winding, but I love this action shot of the yarn! Do look at the details of Steph's winding station, it's quite ingenious. This is how Steph recommends plying - see how far away the lazy kate is? Again, that's to even out any twist. 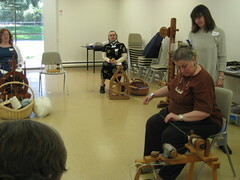 Steph's demonstrating how to ply, and I wanted to get a good shot of Sylvia's wheel. It's made by Alden Amos, by the way. 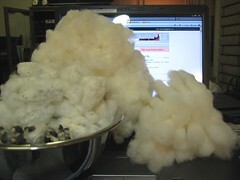 This is the cotton that I've been working on this week - not counting the punis I've spun on the tahkli. That's my laptop screen, for scale. And yes- this is cotton from the back yard! The scary part? This is about one tenth of the total. This is the face that Steph makes when you say "Wait - let me get my camera - now do that again!" This is the first motion of the cards when handcarding. Notice the direction of the handles-- they're easier to see than the direction of the tines. 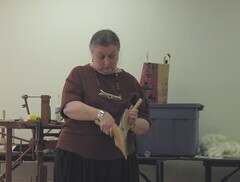 Steph makes two or three more passes in this direction, reversing which card is on top, which helps to transfer fibers from one card to the other. It's hard to see here, but it's important that the tines don't dig in to each other, but just barely brush past. 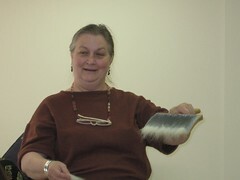 Now Steph is doffing the fibers from one card to the other. Notice that the handles, and thus the tines, are facing the same direction. 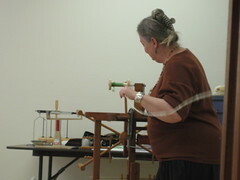 She'll pick up the fibers from the far edge first, and draw them toward her. This shot is a continuation of the last shot, showing the direction of the draw of the cards past each other when doffing. This shot shows what happens when you card with just one edge of the cards. You get a more combed prep, instead of a fluff of fibers going all over. 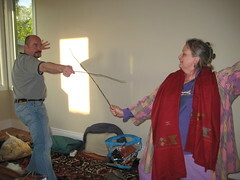 However- there was method to Steph's madness! She added more to the prep by lashing more fibers on the front edge of the tines, much like lashing on to combs. Now, at first, Steph was behind the wheel, and had the spinner (sorry, don't have her name!) doing all the treadling. When someone said, "You have to be on a direct line to the wheel, right?" 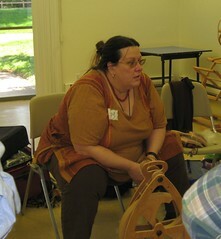 Steph showed that the only straight line needed was from the fibers to the drafting triangle. This is a closer shot of what's happening in the drafting zone - it's identical to the inch-worm type draft for other worsted preps. We did pass the carder around for those who wanted to try it. 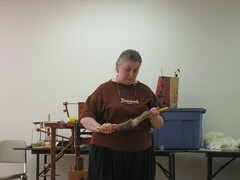 Steph started Day 2 of the class by showing us fabric characteristics. 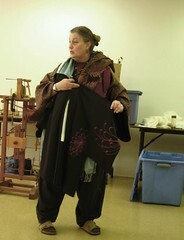 This is a silk kimono, a gift. I've got the color all screwed up trying to show the stitching here. 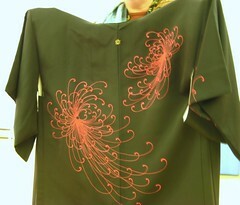 The chrysanthemum is bright red and hand-embroidered, on brown-black silk. Steph told us this is a rather formal men's kimono. See that little dot at the neck? That's a small good luck fetish, a traditional token. This is the lining of that same kimono, showing figures of little boys play-acting as samurai. You can see a better view of the samurais by clicking on this picture, then viewing the large size in Flickr. 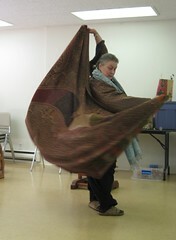 Here, Steph's showing how well 100% wool can flow and drape. She could go for a second career as Flamenco dancer, don't you think? 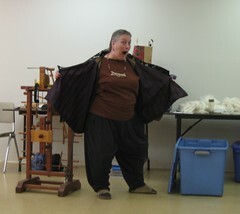 Here, Steph's showing how well 100% wool can flow and drape. 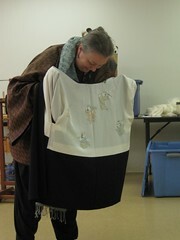 Steph told us the story of this kimono- how the silk came from a tie factory! 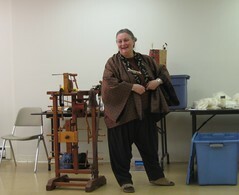 She and a friend were attending a fiber conference, and thought they got a real steal on some silk -- but then somebody told them about the remnant bin at a silk factory. Tonight's post will be heavy on pictures, and short on text because it's late. And I'm lazy when that happens. 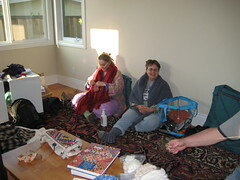 Stephenie and Cecilia just kicked back and knit. 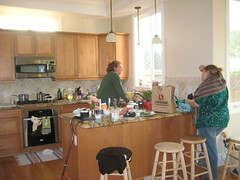 This is Sylvia and Ercil in the kitchen, cooking curried chicken for dinner and brownies for dessert. 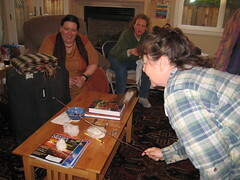 Joy's just kickin' back, enjoying the conversation, and telling us all about her home in the Himalayas. What does this have to do with cotton? 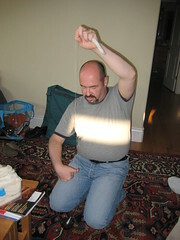 Well, Steph wanted to show us how to bow cotton. 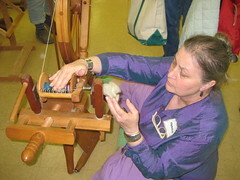 It's an old technique to fluff the cotton to get it ready to spin. Here, Cecilia's giving it a try. Brownies with ice cream and raspberry sauce. What could be better? 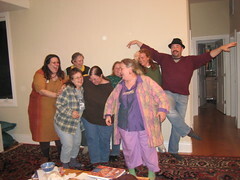 Well, other than fiber... and good friends... And just so you know, we started acting goofy before we had dessert. And they were not those kind of brownies. But they were good. 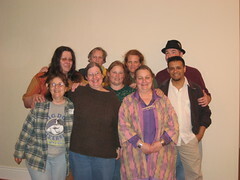 Here's a group shot - Left to right, in back: Joy, Cece, Ercil in the middle, Sylvia, and Alfred. In front, left to right: Cecilia, somebody the cat dragged in, Stephenie, and Carlos. Obviously, we couldn't keep a straight face for long... wait- where did Carlos go? This is Stephenie, looking at my wheel. Yup - my Alden Amos wheel. It was made in the late 70s or so, and is bobbin-driven. Here's the story behind the wheel - a woman in Sierra Madre bought it from Alden in the 70s, then sold it to another woman in Claremont. About a year ago, I saw an ad this woman placed to sell it. She'd had other offers, but took mine because I worked in Claremont and she wanted it to go to someone local. I didn't expect it to come apart this easy! I took it up to Stephenie because the flyer is all wrong for the way I spin. 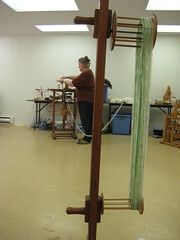 I prefer scotch tension, and this one just wants to make heavy yarn, fast and furious! 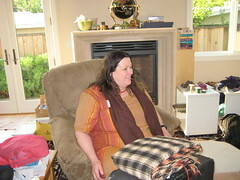 Joy brought this garment from Tibet. It's woven on a backstrap loom in two panels. It's got a twill structure- I wish now I'd gotten a closeup of that. The pattern it forms where the black and white stripes meet is interesting-- I bet a more knowledgeable weaver would recognize it. 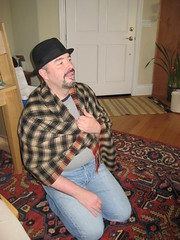 It's modeled by Alfred, whom I met through Sheep Thrills a few years back. Doesn't he look all religious and philosophical and such? Especially with that hat. Don't snicker, it's not nice. I'm not snickering, oh no. Not me. Must be the cat. 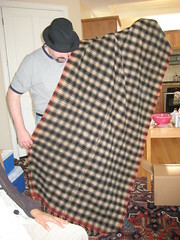 This is a full view of the shawl - isn't it great? You can kinda sorta see the seam down the middle. 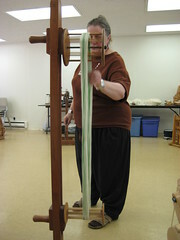 It was woven on a backstrap loom, with selvedges on all four sides. 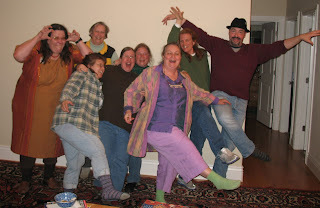 (or would that be eight sides, including the two seamed edges?) We never did agree on which dyeplant gave that orange. The RocketGansey-dottir is progressing well, I better start thinking about where the neckline will fall. 2-3 more pattern repeats and I'll be into the next skein. And I'm progressing well with the cotton on the tahkli. My goal is a couple of punis a day, and I'm well beyond that goal. 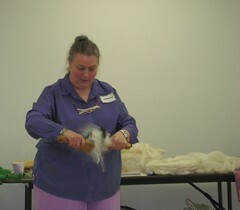 Here, Steph is showing how to use combs (as opposed to carders) to prepare a worsted yarn. 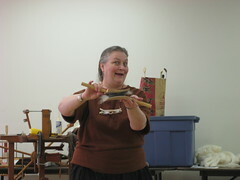 These are combs that Alden makes - these particular combs are one-pitch (one row of tines). No, Steph's not eating the fiber. She's breathing on it, to increase the humidity and reduce the static. 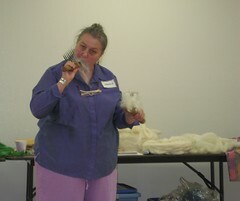 That occurs quite often with wool, especially when it's been properly scoured of lanolin. Combing is also good for removing vegetable matter - the hay and weedy stuff that sheep get into. Stephenie caused a bit of consternation at this point (no pun intended...) She's combing with the points toward herself. She reassured us all that it was no danger - she's not tugging through any snarls, and has good situational awareness. 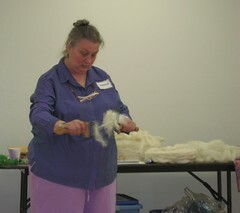 Here, Steph is drawing off a perfectly aligned roving by pulling the fibers through a diz. (a diz is like a button, with one hole. 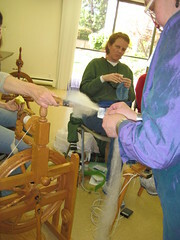 The size of the hole determines the size of the roving.) 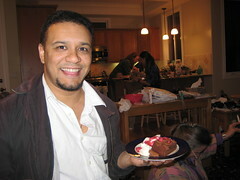 That's Sylvia in the background, by the way.